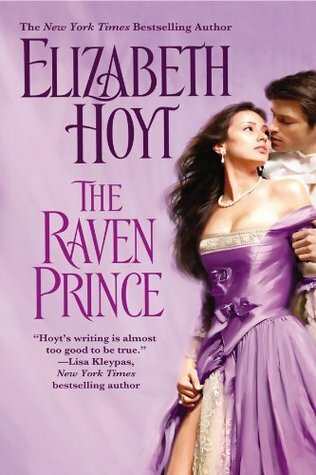 Elizabeth Hoyt’s The Raven Prince hasn’t been around long enough to be “classic romance,” but give it another ten years and it will be. Miss Bates is jumping the gun, but she’ll stick by this claim. Hoyt’s been in Miss Bates’s “get-to” pile of romance novels for a long time. Silly spinster should have read them ages ago because, if The Raven Prince is typical of Hoyt’s writing, she missed out. She now says with confidence that the reading of The Raven Prince is “the beginning of a beautiful friendship.” This is as wonderful a romance novel as one can get and especially so because it plays with references to Miss Bates’s most beloved romance, Jane Eyre. Hoyt’s The Raven Prince works contrapuntally. There are three melodies/narratives running throughout: as mentioned above, Jane Eyre; the plot proper, that is the love story of Edward de Raaf and Anna Wren; and at the start of each chapter, an excerpt of Edward’s deceased sister’s fairy tale of the “raven prince/Edward” and his wife, Aura/Anna. Anna and Edward who shares a name with Jane‘s Rochester, experience the same meet-cute as Jane and Rochester, when Edward, thanks to Anna’s furtive presence, is thrown from his horse. Later, just as Jane is surprised to learn that the angry rider is her employer, Anna too realizes that her angry rider is her employer. Anna is in Edward’s employee not as his ward’s governess, but as his secretary. In both cases, there is a cross-class element to the romance. Anna and Edward work more closely than Jane and Rochester. Like Jane and Rochester, Anna and Edward’s relationship develops along the lines of friendship, shared interests, caustic banter, and sexual attraction and tension. Jane is Rochester’s grey dove; Anna is Edward’s brown wren. Anna and Jane are well-brought-up daughters of poor vicars, respectable, highly intelligent, deeply moral, giving, kind, and supremely literate! Hoyt’s plot deviates from Brontë’s, however, when Anna’s sexual curiosity leads her to disguise herself and lie in wait for Edward in a brothel that he frequents. The subsequent love scenes would have scandalized Charlotte B. and near came to doing so with Miss Bates! But Hoyt doesn’t deviate from Jane on an ethical level when Anna ruminates thus on her two passionate nights with the unsuspecting Edward, “She had thought it would be a simple physical release, but instead it had been a wonderful kind of transcendence.” Anna’s sexual forwardness may be shocking to the sensibilities of a Jane reader; it is also honest and refreshing. Her beautiful concluding thought regarding their shared intimacies is as morally viable a statement as Jane’s insistence that she leave Rochester to preserve her sense of self. What binds Anna and Jane is this stance of self-respect and integrity regarding their decisions and actions. They are eminently loveable and lovingly created. Edward de Raaf, our hero, pulls at the heartstrings no less than the tormented, cynical Rochester: they growl and stomp and order their way to our heroines’ hearts as much as they charm, seduce, and adore them. They’re big, ugly, dark, and glowering, but they eat out of their little birds’ hands as they ache with the need to be loved, desired, and befriended. They are lonely, starved for a heart-mate and companion, protective, irascible, wild, and possess loveable dogs and eccentric servants. But there is no mad wife in the attic for Edward, in her place are the tragic loss of his entire family to smallpox and the death of his wife and son in childbirth. The healthy and hearty physical intimacy that Edward and Anna share can leave the mad wife in the attic by the wayside because there is no necessity for her; Anna does not stand as Edward’s moral arbiter as Jane does for Rochester. In a way, this makes The Raven Prince more palatable to the contemporary reader’s sensibilities, but diminishes the high drama and tension of Jane Eyre‘s “dark night of the soul” when she wanders the moors until rescued by that prig, St. John. When Anna leaves Edward it is out of a mistaken and stupid urge to protect him: it’s lame and melodramatic and a wrong note in a wonderful romance novel. Never for a moment does it feel as necessary as when Jane leaves Rochester, though this cool article on Jane Eyre might argue otherwise. To give Hoyt credit, however, Anna quickly recovers from her self-sacrificing mode and returns to Edward fighting: ready to apologize, re-establish trust, and renew their love and passion. Another wonderful aspect of Hoyt’s novel is her use of setting. Like Jane’s Thornfield, symbolic of the “thorns” of love and suffering that she endures there, Edward’s home is Ravenhill. It is “gothic” like Thornfield, as devoid of family and love and warmth. In it, Anna, like Jane, lives a “full and delightful life,” where she too encounters “an original, a vigorous, an expanded mind.” (These quotations are from Jane Eyre.) And like Thornfield, there is something blighted here, something stunted and lifeless. In Jane Eyre, this is symbolized by the riven tree after Rochester deceives Jane into agreeing to his bigamy. In The Raven Prince, it is the overgrown, weed-ridden, neglected garden. (This symbol of Hoyt’s novel reminded Miss Bates more of Oscar Wilde’s garden in “The Selfish Giant.” ) The garden stands for Edward and Anna both, who have experienced a loss of self-worth, but who blossom and grow and flourish in each other’s presence. Anna nurtures Edward’s spirit and heart, as he does hers, and makes him feel virile and handsome when he is so self-conscious about his smallpox scars( the result of the plague that took his family and left him the sole survivor). Anna says to him, “No garden was ever truly dead if a proper gardener knew how to nurture it. Why, it only needed a bit of care, a bit of love … ” And does exactly that, care for and love him until, though he hasn’t realised it yet, he can’t live without her. At the lowest emotional point of the novel, as Edward is compelled to leave Anna, he echoes Jane’s Rochester (“It feels as though I had a string tied here under my left rib where my heart is, tightly knotted to you … when you go … I am afraid that this cord will be snapped, and I shall bleed inwardly.”) when he too says, “It was as if a cord that had been stretched between them had been severed.” Need Miss Bates say more? She is loquacious after all and still has a few things to say. One more delightful element of Hoyt’s novel is her adept creation of loveable secondary characters, who provide comic relief and are not mere tools to suit her plot. The dog Jock is more loveable a canine than Jane‘s Pilot. The servants, Fanny, Mr. Hopple and his elaborate waistcoats, and the curmudgeonly butler Davis are hilarious. Edward’s friends in the Agrarian Society, Iddesleigh and Harry, though a tad sequel-bait, are still fully fleshed and so darn likeable, especially because Iddesleigh reminded Miss Bates of Heyer’s Justin Alastair in These Old Shades. He carries one of the best Eyre lines in the novel, “And the wren defends the raven.” There is also the wonderful weaving of the fairy tale of the Raven and Aura contained in the little red book that Anna discovers in her desk in the library. It serves as an allegorical counterpoint to Edward and Anna’s courtship and would require a whole new post to analyze. The Raven Prince was published in 2006 by Warner Forever. Miss Bates read a re-issued Kindle edition, which she purchased.